What Is the Cause Of the Ecological Collapse? Dr. Michael Laitman: As of now, the ecosystem of the Earth is collapsing, being crushed, shattered, and annihilated. 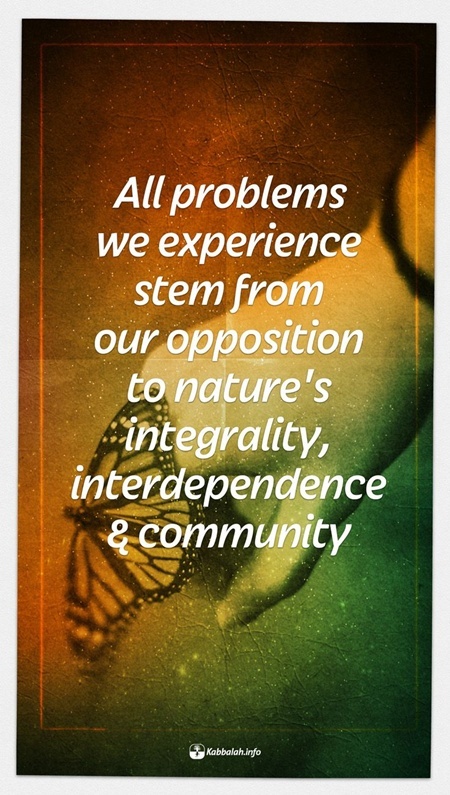 Our incorrect relationship to nature causes terrible problems. We have already reached the North and South poles, where they are getting ready to drill for oil. But on its own, planet Earth possesses an amazing characteristic of renewal under the influence of positive signs that descend from above. So a person’s task is to invite these signs, not to clean the Earth of garbage. This won’t work. As much as we clean it, it becomes filthier and filthier, for chemical and biological cleansing damage the ecology even more. Rather, the idea is that everything found on the levels of the still, vegetative, and animate nature can regenerate and recover at an amazing speed. And this is possible only if a higher spiritual level brings positive signs. The moment that humanity becomes harmonious through integral consolidation, the entire ecology will, in fact. immediately become balanced and the world will begin to blossom and spread a pleasant fragrance. It is not necessary to be concerned about it in particular, just as it isn’t necessary to be concerned about anything that is found below the spiritual level. If we make a correction on the spiritual level, the corrections will pass down and immediately cause changes on the physical level. The more we know about global warming and the threats it poses—the less we seem to care! A recent survey of 1100 Americans, conducted by scientists from the Texas A&M University, showed that “The more informed one is about global warming, the less one feels personally responsible for this problem and the less one is concerned for global warming” (Risk Analysis, Vol.28, Issue 1, Feb 08). In total contradiction to what we would expect, research shows that the more actively the media publicizes the problem, and the more informed we are, the less concerned about it we become! Perhaps our indifference can be attributed to the fact that no one has been able to offer any viable solutions for the impending disaster, or maybe it’s because we feel too overwhelmed by the overabundance of disturbing facts. Hence we choose to simply push the problem aside, for the time being. But clearly we cannot ignore it when it begins affecting us personally—for example, when you happen to be that person in New Orleans whose entire family is wiped out by Hurricane Katrina. Because of the global nature of the problem, any one of us can be next—so why don’t we care? !